Thanks to our supporters, we’ve been making great progress this year to turn the tide on plastic pollution in Ireland. Last week, over 2,000 of them emailed the Oireachtas Environment Committee to make sure they didn’t let Minister Denis Naughten water down the Waste Reduction Bill to indefinitely delay a national deposit and return scheme. Their action resulted in the Committee voting seven to five against the Minister’s amendment and proved that, together, we really can make a difference. But we’re far from done! Laws are rarely simple. We know that from our work pushing through 2015’s Climate Law . Words carry a weight that we rarely see in day-to-day life, with just a small tweak causing a flurrying cascade of consequences down the line. That’s why our ears pricked up when we learnt that Minister Denis Naughten has been manoeuvring behind the scenes to dilute the wording of a draft law for a deposit and return scheme for plastic bottles and aluminium cans . Naughten wants to change the word ‘shall’ to ‘may’ in the report the Environment Committee is finalizing on the proposal. Our Minister for Climate Action, Communications and Environment has just rowed back on his commitment [i] to implement a levy on single-use, non-recyclable coffee cups, of which we use half a million every single day. We’re expanding our Board at Friends of the Earth. And we're asking you - and all our supporters - to consider putting their name forward. If you are interested, then fill in this application form before 5pm on 15th March. Friends of the Earth is a small and nimble organisation campaigning for environmental justice in Ireland and globally as part of the Friends of the Earth International federation. Our vision is of a just world where people and nature thrive. It’s an exciting time for the environmental movement in Ireland and globally as we campaign for a just and equitable transition to a fossil-free future, call for a re-think on unsustainable resource consumption and work in solidarity and partnership with communities and other movements for justice. Our plastics campaign is off to a flying start. On Wednesday, TDs and Senators will begin considering the Waste Reduction Bill. It proposes concrete steps to cut plastic waste, like a deposit and return scheme for plastic bottles and a ban or a levy on plastic-lined coffee cups. 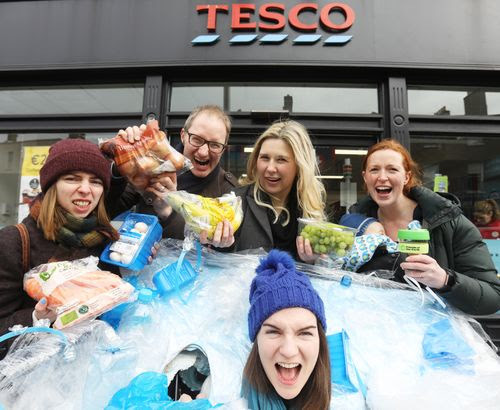 We're joining forces with Zero Waste Ireland, VOICE and Uplift to present a petition outside the Dáil to urge TDs to pass the law quickly, before any election derails progress. They have been working on plastics for a while. Now we're adding our weight, and your voice, to the campaign. "The only option was to put my body in between the diggers and the earth"
A member of Fossil Free TCD went to the UN climate talks in Bonn last month. This is the first of two reports she wrote for us. I am crouched behind a damp sand bank and can feel my heartbeat in my ears. People shuffle hurriedly in both directions next to me, careful not to slip into the trench behind. I am too terrified to peer over the bank, in case I come face-to-face with a riot cop, and his shield or baton comes crashing into me. I huddle down smaller. Can they see my rucksack over the edge? Someone grabs by elbow violently and I almost shout out - but it is ok. My affinity group is planning our next move. We turn to the hundreds lining the cusp of the pit above, as high up as House 6 from the base: “Which way?” we whisper-scream up at them. “Go left!”, “Left!”, “No cops left!” they shout back, and we are off. Last chance to go back, but we’re up and over and gone. Police far to the right but they’ll never reach us in time. I am running before I know it, and look back for my “buddy” Emma, who has asthma. Her, Tony, and Frodo are close behind. Of course, as it turned out, none of these were their real names.